The photos for this item shows the actual contents of one 7 ounce bag of crystals. The contents of each bag varies, depending on the sizes and weights of each crystal. Therefore, the bag you receive may have more or less crystal points than represented in the product photos even though it will weigh approximately the same. The bag you receive will contain a random assortment of prismatic, Quartz Crystal Points that can range in size from about 15mm up to 45mm in length and from around 5mm up to 11mm in thickness. The crystals shown in the product photos actually represent approximately 7 ounces. 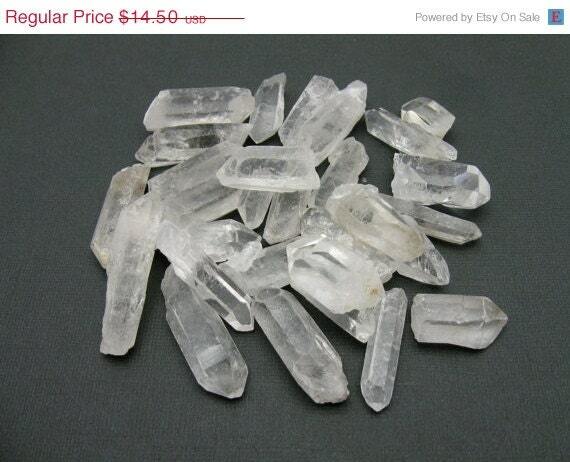 These are natural, raw quartz crystal points randomly gathered into resealable bags. These are natural, raw quartz crystal points randomly gathered into bags that weigh approximately 7 ounces. Each bag will vary and will contain a nice assortment of various crystals. Great for wire wrapping, Jewelry Making, and to use as healing stones! Amazing deal for these!